Background: In May 2003, the government of British Columbia adopted income-based pharmacare, replacing an age-based drug benefits program. Stated policy goals included reducing government spending, maintaining or enhancing access to medicines and improving financial equity. The province's experience on these policy dimensions can inform policy making in other jurisdictions and offers insight into priorities for Canada's National Pharmaceuticals Strategy. Method: The research team created an anonymized database with information about drug use, private and public expenditure and household income for all residents of British Columbia from 1996 to 2004. This database was used to evaluate the impact of the policy on trends in drug expenditures, utilization and sources of payment for seniors and non-seniors of different income levels. Results: In the immediate term, Fair PharmaCare appears to have met many of its policy goals. Government spending was reduced. Access to medicines was maintained (though not enhanced). And the distributions of private and public expenditures were brought more closely in line with distribution of income. Long-run impacts depend largely on how a reduced role for government affects trends in costs, access and equity. Early indications suggest that a larger role for government may be needed to maintain performance on desired policy objectives over time. Conclusion: In the long run, there is reason for setting a new national standard for pharmacare that increases, not decreases, the share of publicly covered spending in every province. The federal government could play a key role by helping provinces increase public funding for prescription drugs and thereby facilitate cost control, maintain access to medicines and enhance financial equity. The recent adoption of income-based coverage in British Columbia marks one of the most significant changes in the history of the BC PharmaCare Program and presents an opportunity for Canada and other jurisdictions to learn more about income-based pharmacare policy. Through a series of papers, we have sought to describe the major impacts of the changes to BC PharmaCare using population-based analyses of a comprehensive drug claims dataset (see Caetano et al. 2006; Hanley et al. 2006; Morgan and Yan 2006). The choice of the empirical studies conducted was guided by input received from policy makers (Morgan and Coombes, page 92). In interviews, policy makers suggested that success or failure of reforms to BC PharmaCare would be indicated by measures consistent with the policy objectives: what was the impact of policy on costs, access to medicines and financial equity for populations of different ages and income levels? In this paper, we review whether Fair PharmaCare achieved the objectives that policy makers sought. We then consider whether there will be long-term policy consistency with respect to the goals and objectives of the BC PharmaCare Program (Pal 2001). Recent changes to BC PharmaCare took place in two stages, beginning in 2002. Before 2002, BC PharmaCare provided prescription drugs for seniors and social assistance recipients at little or no cost, and covered catastrophic prescription expenses exceeding $1,000 per year for all other residents. This scheme closely resembled what the Commission on the Future of Health Care in Canada proposed as a short-term national standard until such time as public coverage could be expanded to become more comprehensive for Canadians of all ages (Romanow 2002). In order to reduce government spending on medicines, BC PharmaCare introduced temporary co-payments under the seniors' drug program in January 2002. This measure was lifted in 2003, when BC PharmaCare began offering income-based coverage that would pay for drug costs exceeding given percentages of household income for seniors and non-seniors alike (Morgan and Coombes, page 92). This new model of the BC PharmaCare Program, called Fair PharmaCare, resembles the proposal of the Standing Senate Committee on Social Affairs, Science and Technology (the "Kirby Committee"), which called for public coverage for drug costs exceeding 3% of household income and private, supplementary insurance for other costs (Canada 2002). Did the Program Achieve Its Primary Objectives? The overriding objective of both the May 2003 introduction of Fair Pharmacare and the 2002 seniors' co-payments was to reduce provincial government spending on prescription drugs in order to meet budgetary targets set for the Ministry of Health. This objective was achieved. Public spending was reduced through the reorganization of the terms of coverage offered by BC PharmaCare. The share of total prescription drug expenditure covered from the provincial government budget fell from a range of 51% to 53% over the period of 1996 to 2001, to 47% in 2002 and 43% in 2003 and 2004; logically, the privately financed portion of expenditure increased commensurately (Hanley et al. 2006; Morgan and Yan 2006). The net financial impact on government and private payers depends upon the degree to which the policy affected total (public and private) spending trends in the province. Total prescription drug expenditure in British Columbia grew at an average annual rate of 12.4% between 1996 and 2001, but at only 10.0% a year from 2001 to 2004. This difference might imply that changes to the BC PharmaCare Program slowed growth in drug spending in the province. If so, estimates of net impacts on private and public payers should reflect this. We present two counter-factual scenarios against which to compare actual expenditure for 2004 (the first full year of income-based pharmacare in British Columbia) in order to estimate the net financial impact of the policy on public and private expenditures, which are summarized in Table 1. The first comparison between actual 2004 expenditure and a counter-factual scenario illustrated in Table 1 assumes that without any policy changes, total prescription drug expenditure would have continued to rise at pre-policy rates. Actual total prescription drug expenditure in 2004 was roughly $1.535 billion. 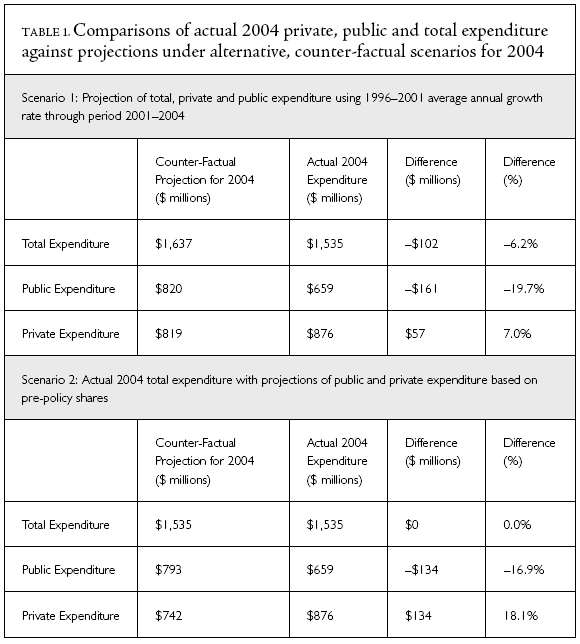 The counter-factual scenario projects expenditure from 2001 to 2004, using the average annual growth rate of the period 1996 to 2001; this yields a projected total expenditure of $1.637 billion in 2004, implying that actual 2004 expenditure was $102 million (or 6.2%) lower than would have been predicted. If we were willing to attribute this entire change in growth rates to the effects of the new policy, we might conclude that the income-based pharmacare program reduced public expenditure by $161 million while increasing private expenditure by only $57 million. Closer inspection of trends in British Columbia and the rest of Canada, however, suggests that such a conclusion would be unwarranted. Two cost-related dynamics explain the slowdown in drug spending following 2001 and 2003 (Morgan and Yan 2006), one related to utilization rates and the other related to product selection decisions. In mid-2003, British Columbia experienced a trend towards the selection of less expensive products. This may be construed as prima facie evidence that the income-based drug plan stimulated more careful consideration of the relative costs of drug options, as policy makers had hoped (Morgan and Coombes, page 92). However, a more detailed examination reveals another possibility: the savings generated because of changes in product selection coincided with a preferential provincial formulary listing of a low-cost, brand-name product within one of the costliest drug categories - proton pump inhibitors (PPIs), which are used for gastrointestinal conditions such as heartburn and ulcers (British Columbia 2003). This policy was introduced in July 2003, months after Fair PharmaCare was implemented but precisely when the trend towards less costly product selection began in British Columbia. Changes in brand selection in response to this formulary-based policy reduced total expenditure in 2004 by approximately $17 million without altering the trends in the utilization of PPI drugs (Morgan and Yan 2006). This selective listing decision accounts for approximately 16% of the $102 million decline in spending that might otherwise be erroneously considered a cost impact of Fair PharmaCare, as in Scenario 1 of Table 1. The balance of the difference between projected and observed expenditures in the post-policy period can be explained by slower growth in the use of medicines by BC residents (Morgan and Yan 2006). One might attribute a reduction in the growth of prescription drug use to the combination of the temporary seniors' co-payment implemented in January 2002 and the transition to Fair PharmaCare in May 2003. Yet, as with the change in product selection decisions in 2003, closer inspection of trends in BC residents' use of medicines suggests that this slowing growth just happened to coincide with the policy change and was not caused by it. Two forms of evidence suggest that Fair PharmaCare was not responsible for changing aggregate trends in drug utilization in British Columbia. First, the reduced growth in use of medicines was not concentrated among seniors, the only individuals whose coverage terms were affected by both policy changes. A statistically significant reduction in utilization-related growth in expenditure was found in all age and income groups studied (Morgan and Yan 2006). It is unreasonable to attribute the slower growth in medicine use among age groups not exposed to the new co-payment to the age-based policy; co-payments on seniors' prescriptions are not likely to have affected non-seniors' drug utilization. It is similarly unreasonable to assume that income-based coverage would slow growth in medicine use among middle- and low-income non-seniors, because the policy increased (albeit very slightly) the share of middle- and low-income household drug costs subsidized by government. The second form of evidence comes from trends in the global and national pharmaceutical markets. IMS Health Inc. reports that the annual growth in global sales for pharmaceuticals has declined from a recent peak of 13% in 2001 to 9% in 2002, 10% in 2003 and 8% in 2004 (IMS 2006). IMS data also show that the growth in prescription drug sales in Canada slowed from an average of 14.3% per year from 1996 to 2001 to 13.0% in 2002, 9.5% in 2003 and 9.8% in 2004 (IMS Canada 2006). Analysis of expenditure dynamics in British Columbia versus the rest of Canada further indicates that the only change attributable to the implementation of the seniors' co-payment or Fair PharmaCare is the emergence of the seasonal "stockpiling" of medicines just before the initiation of the 2002 seniors' co-payment (Morgan and Yan 2006). So while there was clearly a moderation in the growth of both public and private pharmaceutical expenditure in British Columbia after 2001, we cannot with confidence attribute any of this to Fair PharmaCare or the precursor co-payments. The second counter-factual scenario presented in Table 1 demonstrates the more likely explanation. Assuming 2004 expenditures would have been $1.535 billion even in the absence of any policy change, this scenario allocates these costs to private and public sources according to the relative shares that prevailed prior to the policy change. The result: it appears that Fair PharmaCare led to a direct transfer of roughly $134 million from the public side of the financial ledger to the private side. This is equivalent to a 16.9% decrease in public spending and an 18.1% increase in private spending compared to what would have occurred in absence of the policy change. The significant change in the private and public shares of drug spending created by the changes to BC PharmaCare could have significantly affected the population's access to medicines, subsequently influencing health outcomes and health services use. Previous research has found adverse health outcomes in jurisdictions that reduced drug plan spending through the implementation of co-payments or prescription limits (Soumerai et al. 1987, 1993; Tamblyn et al. 2001). BC policy makers hoped to minimize the potential for such reductions in access to medicines among seniors (Morgan and Coombes, page 92). As a consequence, the benefit structure of Fair PharmaCare was designed to ensure that approximately 60% of seniors would have no deductible under the new program and would face per-prescription co-payment charges that were comparable to the cost-sharing on dispensing fees under the previous program. Policy makers also hoped that the (slight) increase in benefits for low-income non-seniors would improve access to medicines for such populations. The secular trend towards slower growth (though not a reduction) in the use of medicines that began in 2002 might be interpreted as an indication that the policy changes in 2002 and 2003 had reduced access to drugs. As discussed above, aggregate patterns of utilization across age and income classes in British Columbia appear to have been influenced by phenomena not unique to the province. To assess patterns of access for specific individuals, we studied rates of access to two of the largest categories of drug treatment: antihypertension drugs and cholesterol-reducing agents. Patient-specific results show that initial access to treatment was not altered by the implementation of policy changes in 2002 and 2003 (Caetano et al. 2006). In particular, there were no statistically significant changes in access as measured by the rate of treatment initiation for individuals of differing age and income categories. This suggests that access was maintained among senior groups whose benefits declined. It also suggests that access among low-income non-seniors - whose benefits improved - did not significantly increase. We also studied the policy impact on apparent discontinuation of treatments for high cholesterol or hypertension. This analysis indicated that the policy did not have a significant impact on trends, but did have a potentially important impact on seasonal patterns of such drug use. Measured rates of seniors' discontinuation of therapy at the end of each calendar year increased in the years following the seniors' co-payment in 2002. This likely reflects the fact that the seniors' co-payment - and, subsequently, the new income-based drug program - involved deductibles. Under programs with deductibles, patients will stockpile medicines towards the end of the deductible period (when drugs are "free" to them). Patients then do not refill prescriptions early in the next deductible period, resulting in the observed seasonal increase in apparent discontinuation of therapy. In 2005, concerned about the effect of seasonal patterns in prescription utilization, the BC PharmaCare Program began offering a monthly deductible payment option for individuals who did not have private, supplemental drug insurance (British Columbia 2004). Finally, as expressed prominently in its name, Fair PharmaCare was intended to distribute public funding for pharmaceuticals more equitably across the population. Our empirical analysis of the financial equity of Fair PharmaCare generated conflicting findings (Hanley et al. 2006). Given continued increases in per capita prescription drug costs, the near-freeze in BC PharmaCare spending during 2002 and 2003 resulted in increased private payments for prescription medicines (as a proportion of household income) for British Columbians of all ages and incomes. Despite these increases in private payments, Fair PharmaCare did redistribute available public subsidies in a more progressive manner than the 2001 pharmacare program. Specifically, by significantly decreasing the level of public subsidy to wealthy seniors and slightly increasing subsidy for low-income non-seniors, the allocation of (the larger amount of) private drug costs and of (the smaller amount of) public drug costs was made slightly more progressive: wealthier residents bore a larger share of the private costs and received a smaller share of the public costs. By far the most significant factor that produced this reallocation effect was the reduction in public subsidy for higher-income seniors. It is difficult to conclude whether the Fair PharmaCare Program, as implemented, was in fact fair. Policy makers achieved the objective of more progressively allocating the scarce public subsidy available under the budget constraint. However, the budget constraint imposed higher private drug costs upon individuals across age and income categories. Furthermore, we did not assess the "horizontal" equity of the Fair PharmaCare Program (i.e., determining whether individuals with equal incomes make equal private payments for prescription drugs in the province). Given that the new program often involves high deductibles (despite being income-based), moderate-income residents with higher needs contribute much more towards drug costs than their healthy neighbours with equal incomes. This can become a significant burden in light of the remarkable persistence of high drug costs among those who need them: individuals who require costly medicines typically require them for years and, often, for life (Kozyrskyj et al. 2005). Our analyses suggest that the adoption of income-based deductibles in British Columbia achieved a number of stated policy objectives related to public drug costs, access to medicines and financial equity. Principally, provincial government spending was reduced through the implementation of income-based deductibles and co-payment. Although drug utilization and expenditure growth slowed during the period of study, this was caused by trends in the pharmaceutical sector beyond the influence of BC PharmaCare. While the Fair PharmaCare policy did not increase access to commonly used drugs for low-income, non-senior households as policy makers had hoped, it did not decrease access for residents of different age and income levels either, as has been the case in other jurisdictions attempting to reduce government drug spending. The major effect of Fair PharmaCare was therefore limited to changing the private and public shares of payment for prescription drugs in British Columbia. Owing to the combined forces of increasing total drug costs and declining total public subsidies, average private payments increased for seniors and non-seniors in all income groups. However, because public subsidies fell most for those with higher incomes, the concentration of private and public sources of financing became relatively more progressive: lower-income households received a greater share of public subsidies and contributed a smaller share of total private finances than higher-income households. Whether the adoption of Fair PharmaCare will be consistent with policy goals in the long term hinges on the effects of the reduced budget for BC PharmaCare. Reducing the role of government payment in this sector - specifically, to establish a drug benefit that pays only for costs exceeding often-high deductibles - may make it difficult to manage the drivers of expenditure and hinder government's ability to achieve other objectives for the BC PharmaCare Program. A reduction in the government's drug financing role will also reduce its ability to influence drug prices - an influence that comes by way of the purchasing power of a drug plan. A plan that covers all, or almost all, purchases for a population has a considerable advantage in its ability to negotiate on price. Under such circumstances, decisions to list a drug on a plan's formulary have significant implications for manufacturers' sales. If manufacturers can reach a pricing agreement with a single purchaser, they are guaranteed a large share of the market, and enjoy the potential of high-volume drug sales that offset the effects of lower prices. This is one of the factors that has allowed countries such as Australia and New Zealand to secure among the world's lowest prices for pharmaceuticals (Birkett et al. 2001; Davis 2004). In addition to influencing prices, drug plan listing decisions can also influence prescribing and utilization practices. Selectively reimbursing cost-effective products will steer prescribers and patients towards such therapies, saving resources and potentially improving outcomes (Garber 2001). Such influence on initial product selection decisions is particularly important, as it is initial prescriptions that set the course of therapy (and related costs) for chronic disease management. However, when a drug plan subsidizes only those expenses beyond moderate or high deductibles, its terms of coverage may have less influence. Our analysis of utilization in British Columbia provided indirect evidence of this. The Fair PharmaCare deductible is zero for BC residents born before 1939 who have household incomes below $30,000 (Morgan and Coombes, page 92). In contrast, Fair PharmaCare deductibles for non-senior households earning over $30,000 are set at 3% of household income. These two groups might therefore respond differently to coverage policies that list certain drugs over others. Indeed, when BC PharmaCare started a preferred listing for a specific proton pump inhibitor in July 2003, the product selection response among individuals aged 65 to 84 was twice that of individuals aged 45 to 64 (Morgan and Yan 2006). If the diminished scale of the BC PharmaCare Program results in rapidly growing private costs, access to medicines may be diminished. Again, coverage from first to last prescription may be important. This is because coverage can encourage patients to fill medically necessary prescriptions they might not otherwise fill. Patients weigh what they perceive to be the benefits and costs when determining which prescriptions to fill. However, they might not perceive the full benefit of treatments because they will not directly feel the positive effects of the drug. If cost-sharing through deductibles and co-payment provides additional disincentive, this may be detrimental to patients' health and to the healthcare system. Of particular interest in this regard will be how future seniors adjust to higher drug costs and lower public subsidy. As mentioned above, the benefits structure of Fair PharmaCare was designed so that approximately 60% of seniors would experience no significant changes in cost sharing. This makes the current Fair PharmaCare Program for seniors quite different from other cost-sharing policies that have been investigated by others (Soumerai et al. 1987, 1993; Tamblyn et al. 2001). However, Fair PharmaCare for future seniors - those born after 1939, including the sizable cohort of baby boomers - will be the same as Fair PharmaCare for non-seniors (Morgan and Coombes, page 92). It will, for example, involve a deductible equal to 3% of income for households earning over $30,000. Since the coming generation of seniors can be expected to have higher incomes than present seniors, it will not be long before a majority of British Columbia's senior population will face an annual deductible of at least $900. The impact of this on future access to medicines and effectiveness of evidence-based coverage policy may be significant. Finally, as drug costs continue to increase more quickly than household incomes, financial pressures will certainly rise among those who require medicines. This factor could reduce some of the improvements in equity across income groups that were initially created by Fair PharmaCare. Moreover, health-related equity concerns will grow in coming years as increasing numbers of households face hundreds (even thousands) of dollars in private drug costs prior to receiving public assistance. For those with chronic need for prescription drugs and whose incomes exceed $30,000, the current structure of Fair PharmaCare results in an implicit 3% annual tax increase. This raises the normative question of whether Canadians should be taxed for poor health. Owing to the structure of the Fair PharmaCare Program, the role of BC PharmaCare may continue to fall in the years to come. The more generous structure of deductibles and co-payments for current seniors is being "grandfathered." For the reasons outlined above, this may further reduce the program's ability to control costs, improve access and increase financial equity. To the extent that reducing the role of government in this sector creates these challenges, there is good reason for setting a new national standard for pharmacare that increases, not decreases, the share of publicly covered spending. The federal government could play a key role in this. Canada might aim to achieve closer to 60% public funding for prescription drugs - the average for OECD countries. This level of public subsidy would facilitate cost control and maintenance of access to medicines. Moreover, our simulated results suggest that it would unambiguously increase the progressivity of both public and private payments for prescription drugs (Hanley et al. 2006). Contexte : En mai 2003, le gouvernement de la Colombie-Britannique a instauré un régime d'assurance-médicaments fondé sur le revenu pour remplacer un ancien régime fondé sur l'âge. Parmi les objectifs visés, mentionnons, entre autres, la réduction des dépenses du gouvernement, le maintien ou l'amélioration de l'accès aux médicaments et l'amélioration de l'équité financière. L'expérience de la province dans ces domaines de politique peut éclairer l'élaboration de politiques dans d'autres pro-vinces et territoires et permettre de déterminer les priorités à établir pour la Stratégie nationale relative aux produits pharmaceutiques. Méthode : L'équipe de recherche a créé une base de données anonymisée avec des données sur l'utilisation des médicaments, les dépenses privées et publiques et les revenus des foyers pour tous les Britanno-Colombiens de 1996 à 2004. Cette base de données a servi à évaluer l'incidence de la politique sur l'évolution des dépenses en médicaments, l'utilisation et les sources de paiement pour les aînés et les non-aînés ayant différents niveaux de revenu. Résultats : Pour l'instant, le régime équitable d'assurance-médicaments semble avoir atteint plusieurs de ses objectifs de politique. Les dépenses du gouvernement ont été réduites; l'accès aux médicaments a été maintenu (quoi que pas amélioré) et la distribution des dépenses privées et publiques a été ajustée de manière à correspondre davantage à la distribution des revenus. L'incidence à long terme dépendra largement de la manière dont un rôle réduit du gouvernement affectera les tendances en ce qui a trait aux coûts, à l'accès et à l'équité. Les premières indications semblent suggérer que le gouvernement pourrait devoir jouer un rôle accru si l'on veut continuer à atteindre, à plus longue échéance, les objectifs de politique visés. Conclusion : L'assurance-médicaments fondée sur le revenu semble avoir permis d'atteindre plusieurs des objectifs de politique de court terme. À plus long terme, il y aurait lieu d'établir, pour l'assurance-médicaments, une nouvelle norme nationale qui augmente - au lieu de diminuer - la portion des dépenses couvertes par les fonds publics dans chaque province. Le gouvernement fédéral pourrait jouer un rôle-clé en aidant les provinces à augmenter les fonds publics alloués aux médicaments sur ordonnance et ainsi faciliter le contrôle des coûts, maintenir l'accès aux médicaments et rehausser l'équité financière. Correspondence may be directed to: Steve Morgan, Assistant Professor, Health Care and Epidemiology and Research Lead, Program in Pharmaceutical Policy, Centre for Health Services and Policy Research, University of British Columbia, 429 - 2194 Health Sciences Mall, Vancouver, BC V6T 1Z3; tel. : 604-822-7012; fax: 604-822-5690; email: morgan@chspr.ubc.ca. This research was supported by an operating grant from the Canadian Institutes of Health Research (CIHR) and a Research Unit Award of the Michael Smith Foundation for Health Research (MSFHR). The Centre for Health Services and Policy Research is supported, in part, by the BC Ministry of Health. Steve Morgan is supported, in part, by a CIHR New Investigator Award and a MSFHR Scholar Award. We are indebted to the BC Ministry of Health and the BC College of Pharmacists for approving and assisting with access to PharmaNet data. The BC College of Pharmacists and Canadian Institute for Health Information provided invaluable assistance in classifying all drugs in the data set. The views presented here are solely those of the authors. Birkett, D.J., A.S. Mitchell and P. McManus. 2001. "A Cost-Effectiveness Approach to Drug Subsidy and Pricing in Australia." Health Affairs (Millwood) 20(3): 104-14. British Columbia. 2003. Changes to PharmaCare Coverage Criteria for Proton Pump Inhibitors. Victoria, BC: PharmaCare, Ministry of Health Services. British Columbia. 2004. "Fair PharmaCare Monthly Deductible Payment Option Introduced." BC PharmaCare Newsletter 4: 4. Victoria, BC: PharmaCare, Ministry of Health Services. Caetano, P., C. Raymond, S. Morgan and L. Yan. 2006. "Income-Based Drug Coverage in British Columbia: The Impact on Access to Medicines." Healthcare Policy 2(2). http://www.longwoods.com/product.php?productid=18513&cat=458. Canada. 2002. "Chapter Seven: Expanding Coverage to Include Protection against Catastrophic Prescription Drug Costs." The Health of Canadians - The Federal Role: Volume Six, Recommendations for Reform. Ottawa: Standing Senate Committee on Social Affairs, Science and Technology. Davis, P. 2004. " 'Tough But Fair'? The Active Management of the New Zealand Drug Benefits Scheme by an Independent Crown Agency." Australian Health Review 28(2): 171-81. Garber, A.M. 2001. "Evidence-Based Coverage Policy." Health Affairs (Millwood) 20(5): 62-82. Hanley, G.E., S. Morgan and L. Yan. 2006. "Income-Based Drug Coverage in British Columbia: The Impact on the Distribution of Financial Burden." Healthcare Policy 2(2). http://www.longwoods.com/product.php?productid=18514&cat=458. IMS. 2006. "Global Pharmaceutical Sales, 1998-2005." Retrieved September 11, 2006. http://www.imshealth.com/ims/portal /front/articleC/0,2777,6599 _77478579_77478598,00.html. IMS Canada. 2006. "Prescription Drug Purchases by Canadian Hospitals and Pharmacies Reach $16.57 Billion in 2005." Retrieved September 11, 2006. http://www.imshealthcanada.com/htmen/ 4_2_1_66.htm. Kozyrskyj, A., L. Lix, M. Dahl and R.-A. Soodeen. 2005. High-Cost Users of Pharmaceuticals: Who Are They? Winnipeg: Manitoba Centre for Health Policy. Morgan, S. and M. Coombes. 2006. "Income-Based Drug Coverage in British Columbia: Towards an Understanding of the Policy." Healthcare Policy 2(2): 92-108. Morgan, S. and L. Yan. 2006. "Income-Based Drug Coverage in British Columbia: The Impact on Private and Public Expenditures." Healthcare Policy 2(2). http://www.longwoods.com/product.php? productid=18512&cat=458. Pal, L.A. 2001. Beyond Policy Analysis: Public Issue Management in Turbulent Times. Toronto: Nelson Thomson. Romanow, R. 2002. "Chapter 9: Prescription Drugs." Building on Values: The Future of Health Care in Canada - Final Report. Saskatoon: Commission on the Future of Health Care in Canada. Retrieved September 11, 2006. http://www.hc-sc.gc.ca/english/ pdf/romanow/pdfs/HCC_Final_Report.pdf. Soumerai, S.B., J. Avorn, D. Ross-Degnan and S. Gortmaker. 1987. "Payment Restrictions for Prescription Drugs under Medicaid. Effects on Therapy, Cost, and Equity." New England Journal of Medicine 317(9): 550-56. Soumerai, S.B., D. Ross-Degnan, E.E. Fortess and J. Abelson. 1993. "A Critical Analysis of Studies of State Drug Reimbursement Policies: Research in Need of Discipline." Milbank Quarterly 71(2): 217-52. Tamblyn, R., R. Laprise, J.A. Hanley, M. Abrahamowicz, S. Scott, N. Mayo, J. Hurley, R. Grad, E. Latimer, R. Perreault, P. McLeod, A. Huang, P. Larochelle and L. Mallet. 2001. "Adverse Events Associated with Prescription Drug Cost-Sharing among Poor and Elderly Persons." Journal of the American Medical Association 285(4): 421-29.